You are here: Home / Movie Reviews / Avengers: Infinity War Movie Review! Marvel Comics has released its grand film Avengers: Infinity War!! In the first weekend, Avengers generated $630 million dollars, a number which would be expected after the big release of Black Panther. Marvel has grown consistently with its characters, resulting in them being brought together to save the universe against the galactic tyrant Thanos. Infinity War is a story where the heroes die and the villain wins. 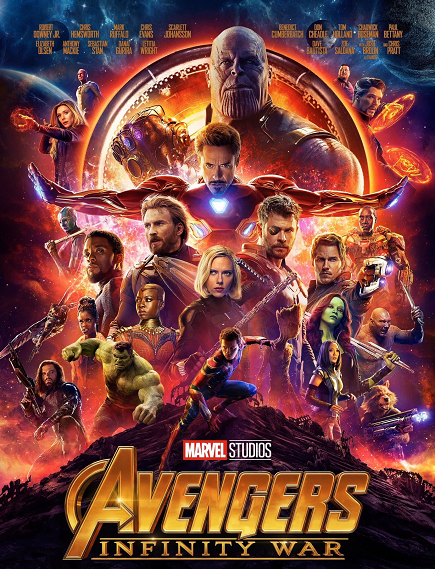 This brought huge interest on who survived because those characters will be the ones who will bring Thanos down and revive the universe. Thanos has been traveling the universe looking for the Infinity Stones. What motivated Thanos to rid half the universe of its population was the destruction of Titan. From this experience, Thanos believed it was his duty to balance the universe at any cost. Thanos had a gauntlet constructed that could contain and control the powers of the Infinity Stones. Thanos tortured and killed to get the stones and was almost stripped of his power. The character of Thanos seems more passionate on film than in the comics. In the Infinity War events, Thanos was driven by his lust for death and mayhem and most importantly win the heart of Mistress Death. In the Infinity War film, through all the death and destruction, Thanos really wanted the divine power to create universal balance.Â In a certain point of view, Infinity War was a movie about Thanos and his quest to become omnipotent. Captain America has returned out of hiding with Black Widow and Falcon. Black Widow has been on the run since Civil War for allowing Steve to escape capture. Falcon is also wanted for his escape from General Ross custody. Captain America was later joined byÂ War MachineÂ , who risked being court marshalled by helping Steve protect Vision from Thanos. Bruce Banner made contact with Steve, then later joining forces with him in Wakanda. Steve and Banner was last seen together in battle against Ultron. Captain America brought his Avengers to theÂ Black Panther and the Wakandian forces to help protect Vision and his Mind Stone. At the end of the Black Panther film, it’s revealed BuckyÂ is being rehabilitated from his Winter Soldier programming by Shuri. Bucky’s arm was also replaced, more than likely constructed with Vibranium. Speaking of creations and assuming Shuri lived, could it be possible that she will also create an energy shield for Captain America in a similar fashion like the Border Tribe? Thanos forces located the stone in Wankanda and began their invasion. The fight in Wakanda was an incredible battle. The Wakandian forces were over ran by the Outrider army but then the tables turned with the arrival of Thor, Groot and Rocket. Ultimately, the Avengers failed in protecting Vision as he perished along with Black Panther, Bucky, Groot, Wanda, Falcon and many others on that battle field. Iron Man has upgraded his armor as he does in each film. This time his armor is based upon nanotechnology just like the black panther suit. With his nanotechnology, he can create different weapons at will, which take on an extraterrestrial appearance. After the invasion in New York, its safe to assume that Tony prepared his armors to be well equipped to combat threats outside of Earth. Do you think Tony’s genius compares to Shuri? How much do you think they could do if they worked together on a particular project like his armors? Once again, Tony Stark found himself in space on a fading phone call to Pepper. This time, Tony doesn’t expect to come back, more than likely overcoming his fears to save the universe. This anxiety plagued Tony in Iron Man 3, the fact of learning that the universe has alien races that could be hostile to Earth. Even with the upgrade, Tony was no match for Thanos and found himself stranded on Titan with Nebula. Tony and Nebula was among the lucky ones who was spared from Thanos purge. The Hulk played an interesting role, In the comic version of Infinity War, it was the Silver Surfer who crashed landed in Dr. Strange’s sanctum and warned Strange of the pending threat to Earth. Also, Thanos quest for the stones was complete, as he was just merely killing for amusement with his god like powers. In this Avengers film, The Hulk was sent to Earth through the BiFrost by Heimdall, before he was killed. When the war on Earth began, Bruce was unable to transform into the Hulk, so Bruce was forced to use the Hulk Buster Armor. Why do you think the Hulk didn’t fight? Was he in fear of Thanos from his first defeat? Neither The Hulk or the Hulk Buster Bruce Banner was a match for Thanos. Even though badly defeated, Bruce is among the survived heroes. SpiderManÂ plays the sidekick to Iron Man once again. In SpiderMan Homecoming, Tony created an iron version of Peter’s costume in hopes he would join the Avengers. Peter did decline the team membership and the iron suit, but kept the upgraded spandex costume. The Iron Spider suit made but made an explosive return in this film. Tony constructed the mechanical spider legs within the suit as seen in the comics.Â Much like Tony’s armor, the Iron Spider also has the ability to survive space. Peter became apart of the rescue to saveÂ Dr. Strange from a ship headed to Titan. Because of Peter’s decision to stay and fight, Tony appointed SpiderMan as an official Avenger. He fought well against Thanos and almost succeeded in removing the gauntlet from his hand. Peter fell short of his goal and perished a painless death. This put Tony in complete shock and grief because he knew Titan was a one way ticket and a mission he thought was too big for his apprentice. The Guardians of the Galaxy is another great addition to Infinity War. They rescued Thor from the aftermath of Thanos onslaught.Â GamoraÂ became an important piece on retrieving the Soul Stone . She knew of this so she requested StarLord to end her life when the time comes. Groot and Rocket joined Thor on his mission to kill Thanos while the rest of the Guardians formed their plan to retrieve the Reality Stone before Thanos could. Thanos was a few steps ahead of the team as he already had the stone. He later tortured Nebula to have Gamora show the location of the Soul Stone. To get the Soul Stone, Thanos must take the life of a loved one and Gamora was his choice. StarLord, Drax, Mantis and Nebula joined Tony, Spiderman and Dr. Strange on Titan to battle Thanos. The only survivors on the Titan battle was Nebula and Iron Man. Infinity War picks up at the end of Ragnarok when the Asgardian ship is met by Thanos. Everyone aboard Thor’s ship were slaughtered, leaving Thor and Hulk sole survivors. Thor believed the only way to defeat Thanos is to create a new hammer. His hammer was constructed as StormBreaker, with the sole purpose of killing Thanos. The weapon also had the power of the BiFrost. With this combination, Thor can reach any part of the universe and realms at will. To use the Bifrost, wouldn’t Thor need the eyes of Heimdall to guide his destinations between time and space? However, StormBreaker gave Thor immense power. Thor arrives on Wakanda to aid his Avengers, causing the opposing army to flee in fear. Thor was able to seriously injure Thanos even after the Gauntlet was complete. Could this mean that StormBreaker is stronger than the Gauntlet? Or if on the same level, could the difference in power really depended on the wielder? In the movie, Thanos retreated from the lethal blow before sending his command to rid half of the universe of life. Thor was able to stand among the survived heroes of the purge. LokiÂ played the Master of Mischief to the end. In Ragnorak, there was a moment where Loki catch sight of his old prize, theÂ Tesseract.Â After his defeat in the Thor film, Loki allied himself with Thanos for greater power. His task was to retrieve the Cosmic Cube from Earth. Loki was severely sidetracked when collecting the Cube for Thanos but in this film, the mission comes full circle when Thanos storms the Asgardian ship looking for it. What’s also interesting about the Tesseract is that it didn’t kill the Red SkullÂ , but teleported him to Vormir to become the keeper of the Soul Stone. Loki in his last act, tries to kill Thanos to save Thor and avenge Asgard. Thanos chokes Loki until his neck breaks. Thanos seemed aware of Loki’s ability to escape death, so he insured it wouldn’t be the case this time around. Vision and Wanda’s relationship has grown since Age of Ultron. Vision has developed the technique to make his appearance more human. It could be for the reasons to blend into society when on the run and to make Wanda feel more comfortable in her feeling for an android. Since Vision has the Mind Stone integrated in his head, he could sense the impending invasion by Thanos. Vision entrusted Wanda to destroy the Mind Stone if Thanos could not be stopped. Wanda was forced to destroy the stone and as a result Vision was vaporized. This was undone seconds later by Thanos with the power of the Time Stone. Thanos pulled the Mind Stone from Vision’s forehead, causing his deactivation and Wanda dies as many others by disintegration. During the surgery, Shuri was nearly complete removing the stone from Vision. Is it possible that Shuri has done just enough to have Vision revived without the use of the Mind Stone? Doctor Strange is an important player to this event because he was the protector of the Time Stone. He is able to fight off Thanos forces with his complex powers but later gave away the Time Stone to spare the life of Tony Stark. Some fans believed Dr. Strange gave the stone away because he explored the future where Thanos could be defeated and that future required Thanos to have the gem. The role of Dr. Strange is different on-screen then the comic book event. In the comic event, Dr. Strange didn’t engage in battle but more or less assisting Earth’s heroes from a safe location. After handing Thanos the stone in Infinity War, Strange dies without worry as if he know he made the right decision and it was up to Tony to pull himself together and defeat Thanos. This film was loosely based on the comic books Infinity War and Infinity Gauntlet. In both issues, there are many more characters involved in this epic war than we seen in the film. The Black Panther was in neither comic story but made a great addition to the cinematic universe. Also in the comic books, Adam Warlock is the Guardian of the Soul Stone and heÂ is to be the leader for Earth’s heroes against Thanos. Adam was mentioned at the ending of Guardians of the Galaxy Vol 2, will he make an appearance in this galactic battle?Â In the credits scene of Infinity War, Nick Fury was seen sending a distress signal to what appears to be Captain Marvel. Will she along with Adam Warlock battle Thanos in the next film? What about the Celestials? Will the gods of the universe band together on a cosmic scale and fight Thanos as we seen in the comics? Disney has bought the rights to some Fox Marvel characters such as the X-Men. Could they make an appearance in the next film? With a lot of Earth’s population gone what will be the premise of the next movie? So, how do rate Avengers Infinity War? Leave your comments below andÂ Check Out These Exclusive Collectibles For Avengers: Infinity War!! What Happens If Avengers: Infinity War is Bad?